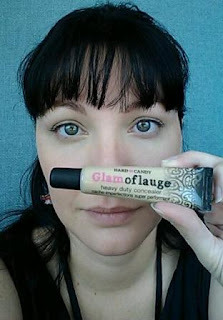 Today I have a multi-product review of Garnier's BB Cream, Tarte's Natural Cheek Stain, and Hard Candy's Glamoflauge. 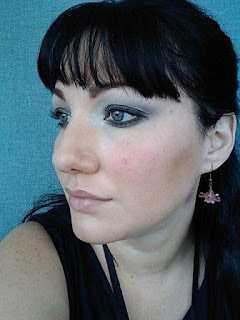 I don't have a whole lot to cover up, so I mostly look for foundations that will just even out my skin tone a little bit. I don't have any problems going completely without foundation if I'm not in the mood to fiddle with it, and I'm fortunate enough to have clear skin that looks just fine bare (I think so, anyway). I am finding more interest in corrective measures, such as wrinkle prevention, spot correctors/skin whiteners, and pore minimizers. From the chatter I've heard, the BB Creams from Korea are the best for these purposes, but before I knew that, I tried out Garnier's BB Cream, Skin Renew Miracle Skin Perfector in Light/Medium. So, it's more of an ultra-thick tinted moisturizer. It has sunscreen in it, and it is moisturizing. It also feels heavy and greasy if you put on too much. All you should need is a pea-sized amount, dot it around your face, and then rub it in. Seriously, really rub it in. Any skin-perfecting, airbrush finishing is going to come from filling in the pores with product. Yep, it sounds gross. But hey, it's skin, we've all got it, and most of us have the same issues with it. So put on your first layer, and then let it set for a few minutes. If you want it to help conceal large pores, take a teeny-tiny amount, and apply it to areas that didn't smooth over as well as you would like. Then really rub it in. You are kind of spackling it up, honestly. The finish is dewy, but not glittery. I like dewy, and I like glittery, too. If you want a matte finish, you will need to set it with powder. My nose tends to get oily throughout the day, so I blot it with plain tissue paper, and it doesn't disturb the cream. I have been using this product for about 3 weeks, and I have not noticed any benefits that last after I remove the cream. 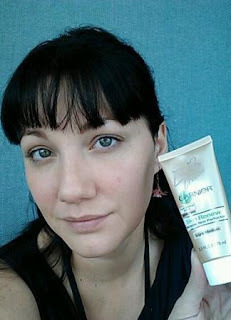 So, I do like it, but it really is just a thick tinted moisturizer. 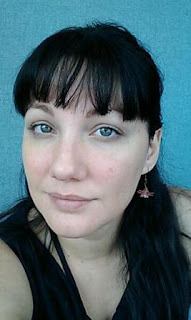 Here's a pic with just the BB Cream added to the bare face from above. There's not much difference in the photos other than an evened out skin-tone. In person, you would see that the pores around my nose have been concealed. Now, I do have a bit of darkness under my eyes and along the bridge of my nose. That's what you get when you have an infant in the house. Today the dark circles weren't so bad, but man, you should have seen it on Monday. Yikes. Anyway, to combat the dark circles, I use Hard Candy's Glamoflauge Heavy Duty Concealer in Medium. Does it work? Holy smokes, does it ever! This stuff stays in place all day long. It only takes a teeny, tiny, little itty bitty bit to do each eye. It was designed to cover up tattoos, so your dark circles are no match for this stuff! I apply it under my eye, along the bridge of my nose, and then I blend it down the side of my nose, the part where my cheek meets my nose, and then the top of the cheekbones. Basically, it's just thinning the product out to nothing so that you don't have reverse-racoon eyes. I usually only use this concealer on days when my circles are super-dark. And there is a picture of my face after applying the Glamoflauge. 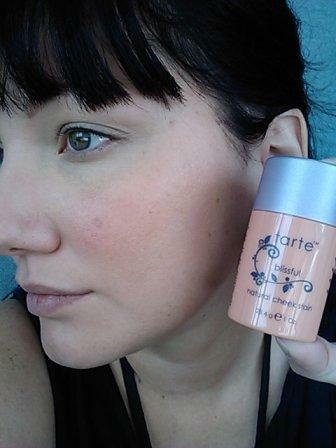 Finally, we get to my new favorite blush, Tarte's Natural Cheek Stain. I have the shade "Blissful". It is a peachy coral shade, with tones of pink. I apply it with a stippling brush (realTechniques brand), and it goes on so easily. You can build up to the intensity you prefer, and I recommend that you build it up slowly, as it doesn't come off easily. Well, it washes off just fine, but you'll be taking off your foundation, too. So do build up your intensity slowly. This blush also has a nice fragrance to it; to me it smells of mandarin oranges. I don't know how long the scent lingers, because I am not overly sensitive to fragrances.